Having both your wedding and honeymoon in Kenya has one big advantage: You’re avoiding the stress of traveling across continents during the most important days of your life. You can travel to your romantic destination, have your big day all relaxed and settled, and start your honeymoon immediately following the ceremony. What's YOUR dream honeymoon in Kenya? 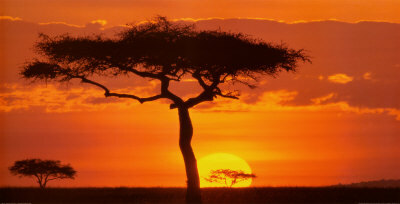 Kenya is the premier safari country in the world. It has the finest and biggest wildlife parks of Africa, where you meet animals in the wild. The scenery is often breathtaking. But don’t forget that Kenya also has 500 kilometers of white-sand-and-palm-tree beaches with many excellent, small beach resorts. You’ll have your own white cottage here overlooking the ocean, and have dinner in the open air. They are often small, meaning they are quiet and you’ll get great personalized service. Many hotels and beach resorts have their own wedding service. They can arrange everything from flowers and photographer to choirs and help with the legal stuff. Here are some options for saying the big yes: in a wildlife park with Kenya’s dramatic scenery as a backdrop, on the beach overlooking the blue Indian Ocean, in a traditional dhow sailing past the ancient town of Lamu, in a hot air balloon over Amboseli National Park, or right on the equator. However, the only wedding planning agency in Kenya that I can recommend is Ivory & Pearls run by Irene Okech. As a Dutch woman she got married in Kenya herself a few years ago. Read her story here. Getting Married On The Beach! If you’re thinking of getting married on the beach, here’s a page with all the pros and cons of Kenya beach weddings. One big advantage is that some of the biggest and most popular wildlife parks, like Tsavo East and West, are close to the beach region. If you’re looking for more information, here’s my main page about weddings in Kenya and the legal details of Kenya weddings. And you can get in the right atmosphere with this page about Kenya wedding photos! You see, there’s all the reason to do your wedding and honeymoon in Kenya.